How to convince potential buyers that the Blu-Book Production Directory is worth the investment over competing directories. Design a multi-target direct mail campaign that would be personalized to the specific recipient. Use a unique selling proposition (USP) to position the Blu-Book Production Directory as the most thorough and accurate information directory available. Establish a hard-hitting, pertinent theme to set the Blu-Book apart from competing directories. Meet proven direct marketing standards by using well-researched direct response copy and graphic techniques. Encourage maximum response through valuable information premiums. 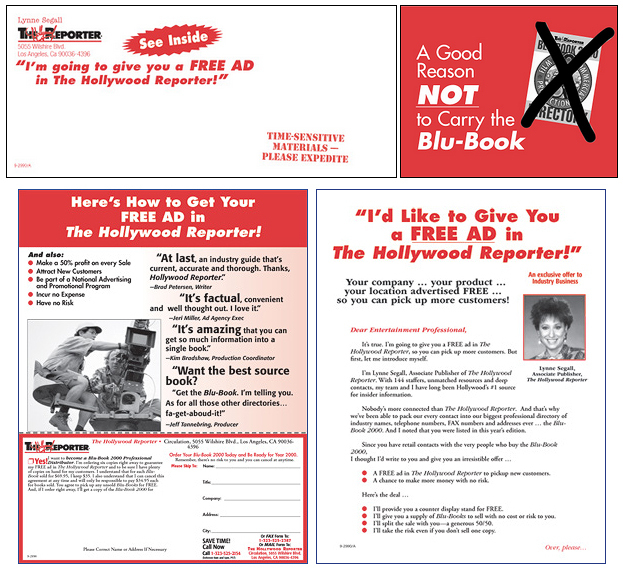 A direct mail package was developed that included a “teaser” outer envelope, a letter from Blu-Book and The Hollywood Reporter associate publisher Lynne Segall, a liftnote, an order form and a reply envelope. Two different themes were created for testing purposes. The first emphasized the “million-dollar connections” that entertainment executives would have access to through the new Blu-Book. The second focused on the fear factor of not having up-to-date production information on hand when needed. In terms of their tone, both letters positioned ownership of the Blu-Book as the key to Hollywood insider information. As support, a list was included that compared the Blu-Book one-on-one with various competitors to emphasize its unique strengths. To further accentuate the “insider” aspect, two free reports were promoted as a Quick Response Bonus: The Ultimate Insider’s Guide to Making or Breaking the Deal and Top 10 Trends That Will Reshape Hollywood. A humorous “WARNING! Out-of-Date” sticker was included on the order form to draw attention to the “severity” of the problem. Readers were instructed to cut out the sticker and place it on their old directory to avoid blowing their next deal. Both direct mail packages pulled exceptionally well, overcoming the industry skepticism.